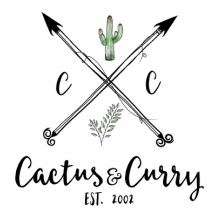 Grandparents - Cactus and Curry - Get your bloom on! Although some think that our precious Isabella is our child, she is our granddaughter! She is currently five years old and lives in Germany with her mother, our oldest daughter and her father. She is absolutely a spit-fire and gives everyone a run for their money! But we don't mind! She takes after her grandmother and she keeps us young and in shape! Which is a good thing....because we have a second granddaughter on the way!